Every year Christians ask me, “Should I celebrate with all the traditional customs of Christmas? They all seem so materialistic. Aren’t some of these customs really pagan?” So every year, I endeavor to bring out a few facts from our Christian heritage. 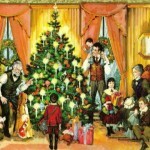 Let’s start with the real shocker – There really was a Santa Claus (however, he is not the one that people know today). The real Santa Claus was a PREACHER!! Yes Sir! His name was St. Nicholas and he lived and worked as the Bishop of a little town of Myra, (now in the country of Turkey). Tradition says he was born in Patara, a seaport, and traveled to Egypt and Palestine as a young man. Eventually he became bishop of the church at Myra. During the period of persecution of Christians by Emperor Diocletian, he was imprisoned, but he was released by Diocletian’s successor, Constantine the Great. By the 6th century his burial shrine was well known at Myra. In 1087 his remains were moved to Bari, Italy, which became a crowded pilgrimage center in his honor. Devotion to him spread throughout the Christian world, and he was chosen patron saint of Russia and Greece. Thousands of churches throughout Europe have been named for him. His feast day was set on December 6. He was credited with many miracles. In one story he saved three officers from by appearing to Constantine in a dream. In another legend he provided bags of gold to a poor man as dowries for his three daughters.¹ When he died on December 6 in the year 345, he was revered for his generosity and kindness. It became the custom to give gifts to loved ones on his saint’s day, the date of his birth. Later Christians adopted St. Nicholas for Christmas day, which commemorates the date God gave the greatest gift of all, Christ Jesus for the redemption of the world. Santa Claus is probably a Dutch mispronunciation of Sinter Klaus (Saint Nicholas). Kriss Kringle is probably an English mispronunciation of the German, “Christkindlein” (little Christ child). In 1822, Santa received a drastic makeover through the poem penned by a pastor. Rev. Clement C. Moore felt his church’s poor offerings were going to make a very dismal Christmas for his children. The weather was bleak and everyone needed some cheering. Rev. Moore held down a secular job to help meet expenses. He had been thinking of Saint Nicholas, from all accounts a very serious and austere man in appearance. A story began to form in Rev. Moore’s mind, his children would love a good story. What about a visit from Saint Nicholas? He looked over at the portly German fellow who drove the sleigh on their way home from work. A new vision of St. Nick began to take shape – the horse drawn sleigh … NO! … flying reindeer. Well, you know the poem by its first line, ‘Twas the Night Before Christmas. The poem was intended for his children’s ears, only, but after great insistence it was read to his congregation. A parishioner published the poem a few years later in a Troy, New York newspaper. In the 1950’s Coca Cola needed a spokesman for their soda at Christmas time. Someone drew an artist’s rendering of Rev. Moore’s St. Nick and Coca Cola made the jolly ol’ elf famous as we have him today. Till about the year 250-300 there was little celebration of Christ’s birth, other than a solemn memory. His and resurrection were all important to new Christianity. As the church spread around the world, it encountered the Roman/European festival of the Winter Solstice. This was a day of great festivity in the pagan world. Because there was no knowledge about the date of Jesus’ birth, a day had to be selected. The Eastern Orthodox and the Eastern Rite churches within the Roman Catholic church chose January 6. The day was named Epiphany, meaning “appearance,” the day of Christ’s manifestation. The Western church, based at Rome, chose December 25. It is known from a notice in an ancient Roman almanac that Christmas was celebrated on December 25 in Rome as early as AD 336. In about 547 A.D. St. Augustine was sent by Pope Gregory the Great as the first official missionary to England. He followed an edict from the Pope, “If the religious customs of the people are not evil in origin, they should be blended into Christianity.” (This is scriptural read Acts 15:19-20). The early church had a real problem with this all important festival of the SUN God. The church in the Holy Land had begun to observe January 6th at the birth of our Lord. The Austrian church observed May 20th. Still other parts of the church observed March 25th. In 625 A.D. central leaders of the church decided since people were going to celebrate the re-birth of the SUN on December 25th – the church would really celebrate – the most important birth, the birth of the SON of God. It took a little time but Christianity prevailed. Although two customs, the Yule long, and kissing under the mistletoe still remain from the pagan days, most every other custom we have today comes from Christ’s birthday. Should We Celebrate With the Christmas Tree? Much confusion has concerned the beautiful Christmas tree. Jeremiah 10:2-4 (NRSV): “Thus says the LORD: Do not learn the way of the nations, or be dismayed at the signs of the heavens; for the nations are dismayed at them. For the customs of the peoples are false: a tree from the forest is cut down, and worked with an ax by the hands of an artisan; people deck it with silver and gold; they fasten it with hammer and nails so that it cannot move.” This scripture certainly sounds like a description of the Christmas tree. Many use this scripture to teach against a Christmas tree and the customs in the celebration of Christmas. But, is that really what the passage speaks of? Let’s read on. Verse 5 has the key – this is speaking of hewing down a tree and carving an idol to be gilded or silvered, and placed as a “god” for worship. This has nothing to do with a Christmas tree as you and I know it. The nations around Israel had some terrible idol “gods” whom they worshipped. The custom of decorating a tree comes directly from the Great Reformer Himself, Martin Luther and from a German Play about Adam and Eve in Paradise. One Christmas eve, Martin Luther was out in the field and the beauty of the stars shining through the snow covered limbs of the tree overwhelmed him with the beauty of God’s creation. He had to show his children. Rather than risk their health in the snow, he cut down the tree and carried it home. Candles replaced the stars, and thus the Christmas tree began. There was also a very popular play in the German church about Adam and Eve. The paradise tree was a central theme of the play. It was adorned with fruit — all representing the things they were allowed in the garden. After Martin Luther’s example, many families adorned a paradise tree with fruit, or even gilded fruit (our glass balls) as gifts to their children, and to teach them of the provision and goodness of God who gave the best gift. Later Prince Charles carried a tree home to Buckingham Palace where Queen Victoria decked it for Royalty. Society news spread all over the world, and the decorated tree immediately became the symbol of the gifts God had given, and, the evergreen tree, the symbol of everlasting life. Our burning of lights (previously candles) is a symbol that Christ is the light of the world.The rich foods and deserts come from the precious gifts the Magi brought to Christ. Mincemeat pie is the real symbolic food of Christmas. It is full of spices and fruits (and yes, if made correctly) meat! (A luxury in the days of no refrigerators). It was baked as a symbol of the gifts, spices, and treasures of the Wise Men from the east. Originally churches rang (or tolled) their bells when someone died. Churches in medieval times tolled their bells to tell the devil his time was short, because Jesus was born. Over the years, the very pious and religious have sought to stamp out festivities. Old laws can be found which forbid any celebration in 1644 in England, and several in the early years of the American Colonies — but the truth is, we have something to celebrate! God gave His son for our redemption. Mary celebrated, “My soul doth magnify the Lord and my Spirit hath rejoiced in God my Savior … For He that is mighty hath done to me great things and holy is His name.” (Luke 1:46-47). The shepherds celebrated, the angels celebrated, the “Wise Men” celebrated and gave gifts. You can still hear His name in department stores. You still see His image in manger scenes. You still find people who desperately need to know the truth of this Jesus – This Savior. Get out the lights, the food, the gifts. Show your love. God did, He gave us Jesus, His greatest gift! Yes, you can celebrate Christmas and let others know about Jesus!